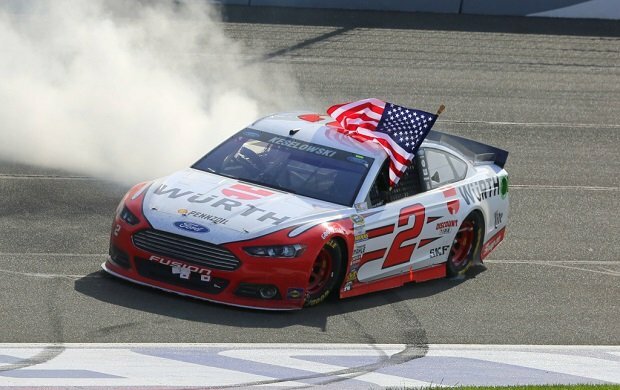 Brad Keselowski led only one of the 209 laps, but it was the one he needed to lead, as he held off the dominant Stewart-Haas Racing duo of Kevin Harvick and Busch to win. Paul Menard and Ryan Newman completed the top five. Keselowski passedpolesitter Kurt Busch on the final lap and pulled away to win his first Sprint Cup Series race of the season. Trying to make one last desperation run at Keselowski, Busch scraped the wall in the final corner. With this win Keselowski has likely punched his ticket into the Chase for the Sprint Cup. Harvick fell just short of a three-race West Coast sweep, but finished second to extend his streak of top-two Sprint Cup finishes to eight. Richard Petty holds the NASCAR record with 11 straight in 1975. Kevin Harvick finishes second for eighth straight top-two finish. Greg Biffle crashed behind them during that final lap, however Nascar let the field keep racing while Biffle got his car off the track, and Keselowski finished strong. “At the end, we caught some breaks and made the most of the breaks we caught,” Keselowski said. Busch was disappointed but philosophical about the result. Busch, in just his second race back after a three-race suspension, responded afterward. “It was a solid day,” Busch said. “I don’t know what we could have done different. We just got pinned in by the yellows and the sequence at the end on which tires we needed to have to optimize how many laps were left. Matt Kenseth wasn’t the fastest car in Fontana, but his pit crew continued to put him out front on pit stops. But while leading on the final pit stop, Kenseth broke an axle and his promising day was ruined. He finished 31st.